Outfitting your vehicle's interior with good-looking, durable floor mats can get expensive. Fear not, however: the nice folks at Lloyd Mats are here to help, with Lloyd Classic Loop Floor Mats. The economical choice, these choice floor mats are designed to be affordably high-quality and handsome over the long haul. Vehicle-specific design makes for a custom, tailored look, and 22 oz. polypropylene yarn construction means these mats resist stains, soiling, and fading. Lloyd Classic Loop Floor Mats will maintain their great looks thanks to this rugged material's crush-resistance, while multi-layer backing provides a solid foundation that won't slide and won't allow moisture to seep through. A system designed to exact factory specs anchors everything in place, and, best of all, these floor mats offer you choice: 8 OEM colors and up to 1,000 graphics and designs let your mats be 100% custom, exactly how you want them to look. It's hard to find a good deal in floor mats these days. 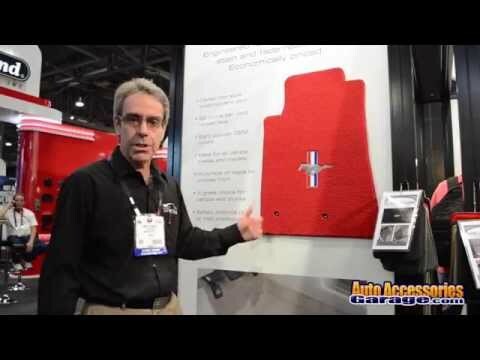 Lucky for you, Lloyd Classic Loop Floor Mats are here to help. Backed by a 2-Year Warranty. Very nice floor mats. Embroidery was clean as well. Nice thick material and fit car perfectly. Also arrived way sooner than expected. Very happy, look great. Don't think that you should show mats with the car logo on them and just send solid black, NO LOGO. Kind of Deceiving don't you think???? Mats fit perfectly, quality and appearance seem good. Very happy with my new mats! Okay mat but the anchors did not match factory. Installed in 98 Grand Cherokee. Very nice quality, Color was perfect match. Price couldn't be beat. Will do business with them in future. Perfect fit my CTS... the color match shown on site was same as product. The price was right, it arrived in a timely manner and was just what I needed for my car. So I also ordered a window sun shade that would fit the car... again the price was right, it was a patriotic pic on the shade - had not seen this on other sun blockers. I am pleased and have referred friends to this site. Great. I love them and would buy more. Great quality mats. Fit my 2014 super sport Camaro. Great, SS logo looks awesome and fits the car perfect. The mats fit perfectly. The nap is very low on the carpet and makes them appear cheap, which by the price, they are not. Color selection is good, and they go with the interior very nicely. The non slip backing works well.